While birds have long been recognized as important seed dispersers in temperate systems, mammals are becoming more widely known for the role they play in seed dispersal. In a new study, researchers at Oregon State University sought to quantify the role bears in Alaska play in dispersing seeds. The authors estimated that brown and black bears disperse over 200,000 seeds per hour per square km while foraging for fleshy fruits and then excreting them on the landscape. Brown bears disperse more seeds than black bears overall, and at different times of the year. Brown bears tend to be the dominant seed dispersers from the last week of July to the first week of August, when salmon migrate upstream to spawn and then die. At this point, brown bears focus their efforts on consuming salmon and black bears become the dominant seed dispersers. This pattern sustains until the fruits dry up and fall from the plant in the fall. 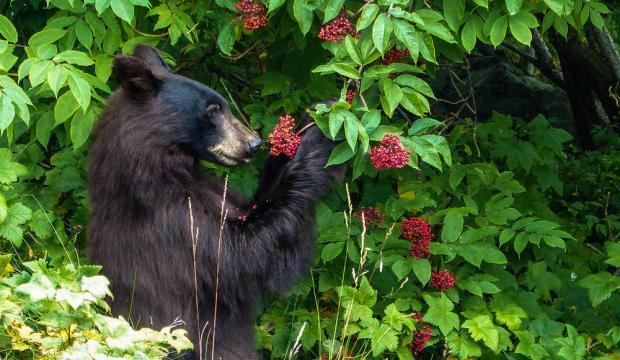 The authors used several novel tools to monitor seed dispersal by bears, including camera traps and residual DNA from bear saliva left on berry clusters. To measure fruit ripening of devil’s club berry clusters throughout the season, the authors used the USA-NPN’s fruiting phenology protocols. Because bears disperse a large percentage of the seeds of fleshy-fruit bearing species, they have a great influence on the species composition of plants in their ecosystems. If populations of bears are reduced, the number of fleshy-fruited shrubs may also decline and be replaced by wind-dispersed plants. This would drastically change the makeup of species and have cascading impacts on the environment. Citation: Harrer, L.E.F., Levi, T. 2018. The primacy of bears as seed dispersers in salmon-bearing ecosystems. Ecosphere 9 (1):e02076. Doi: 10.1002/ecs2.2076.